Hi everyone, today I'm here for Craftie Cafe and I’m going to make a graduation card. 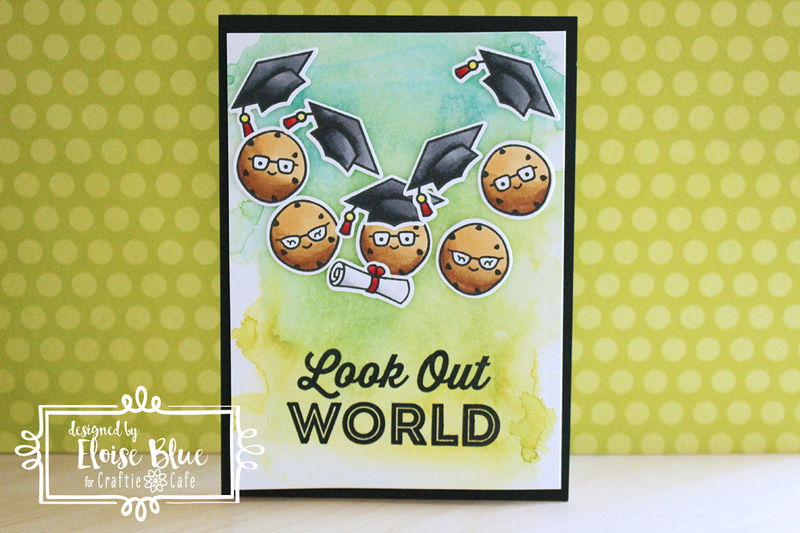 I’m going to be using the Happy Graduation stamp set from My Favorite Things along with Smart Cookie from Lawn Fawn. To begin my card I first stamped, coloured and die cut all my cookie images along with the hats and diploma. I used Copic Markers for my colouring since they’re fast and easy and honestly my favourite. Once all my images were prepped I could work on my background. I first took out three colours of Distress Oxide Inks in Peeled Paint, Broken China and Cracked Pistachio, I smooshed the three colours onto a rectangle acrylic block and then spritzed it with water a few times. I then took my paper, laid it over top and pressed down. When I lifted up all the colours were blended together and in a rectangle. I then sprayed the panel a few more items to get the colours to move even more and then heat dried it with a heat tool. 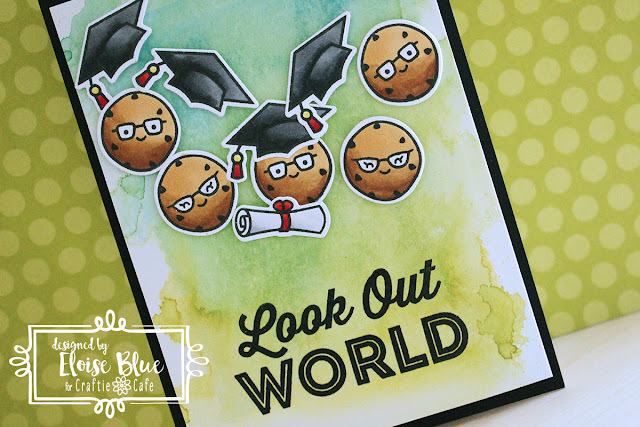 Once my panel was dried I went and added foam tape behind all my images and also stamped my sentiment ‘Look Out World’ from the Happy Graduation stamp set with black ink onto the bottom of my panel. I then adhered down my cookies, hats and diploma to look like they were throwing their hat’s up in the air. Once everything was adhered I mounted the panel onto a black card base with fun foam and that finished up my card. SUper cute card....love the 'smart cookies' and their graduation hats..!! Adorable grad card. Love the background!